It is interesting that during a period in history when there are so many ways to connect quickly and concisely – via email, Twitter, Facebook, Skype, FaceTime, and of course by landline and cell phone – time remains, ever still, our most precious commodity. It wasn't too long ago that mass communications in a company were conveyed by a printed and hand-distributed memo and employees had physical mailboxes. If you wanted to let a friend or relative across the country know what you were up to, you would write a letter. If you wanted to apply for a job, you mailed a resume and cover letter and then waited weeks for a response. But the more time we save with today's convenient, on-the-spot communication vehicles, the less time we seem to have. And because we can communicate so easily through our gadgetry, human interaction has never been more precious. 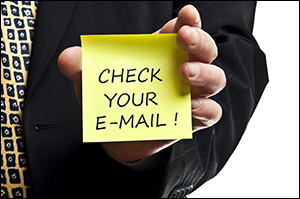 However, in the business world as in personal relationships, it's important to know when NOT to email. While email is an effective means of communication, it also has become a crutch many of us rely on to absolve ourselves of the responsibility of making sure others are informed. When we send an email update to one or more colleagues, we often mentally wipe our hands clean of the issue: "I sent you an email. It's up to you now." But the number of emails employees receive each day can be staggering. For many, there is no other work to do each day other than respond to emails. Whether the job is project manager, account manager or subject matter expert, it may well be more accurate to change those job descriptions to "master emailer." And when it comes to collaborating with a large team on projects, email can actually serve as a major hindrance to productivity. Yes; it's a great way to communicate information to a large number of people. However, when people respond – either to select individuals or the crowd at large – email discussions can be unwieldy and nonproductive. Tones can be misunderstood – or even understood all too well as a conveyor of passive-aggression that would not be acceptable in a face-to-face discussion. It is important for workers and managers to recognize that email is a tool that is best served for simple communication. It generally should not be used as a communication strategy for discussion or collaboration, as group conversations can get out of control, people are left out of the loop, and some may not be able to keep up with the thread of discussion – thus losing the opportunity to weigh in with their insights and/or expertise. It may be less confrontational to reprimand a direct report by email, but this vehicle should not be used for sensitive employer employee relations and management relations. And while you may follow up with a mass communication email, it would best to discuss a major organizational change that impacts workers' jobs and wellbeing in smaller groups or individual sessions. The same applies to sensitive HR communications. To help your workforce maximize this convenient communication tool without sabotaging their own and others' productivity, the following is a list of Email Etiquette Guidelines to enhance communication skills in the workplace. Use correct grammar and capital letters where appropriate, as these formalities help make the communication easier to read. Proofread before sending. Keep it concise without being rude. Make it easy to skim by using short paragraphs of two to three lines. Don't waste people's time with formalities, but be polite and professional. Don't go crazy with CCs. Only include people who need the information and/or have requested it in the past. Most importantly, remember that email is not the only form of communication, and many times it may not be your best choice depending on what you need. Sometimes, it's just easier to call the person, particularly when you need a back-and-forth discussion to reach a consensus. Want to learn more about communicating? Sign up for Fickewirth's next webinar on how to communicate with millennials. Did you know that by the year 2020, it's expected that they will make up more than 40% of the U.S. workforce?